At barely 14, H is already sensitive to what others are saying about autism and he often feels uneasy and personally threatened by representations of autism in the media that are framed as tragedy and epidemic. I have previously written posts about that – about the need to reframe tragedy – and about how these layers of autism stigma go deep and affect my child to the core. So here is a little message of Awareness to consider, along with a request for empathy, as we make our way toward that month of April. 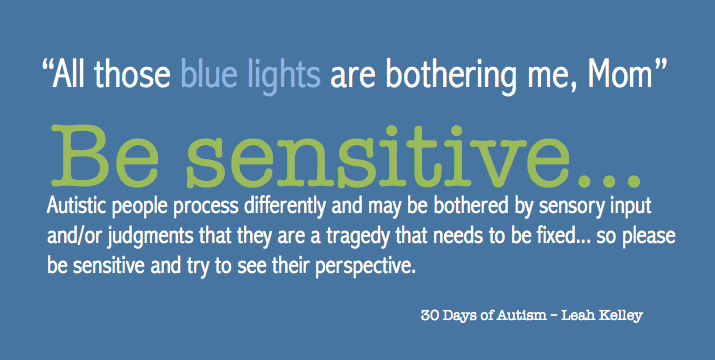 Image Description: Blue rectangle with text that reads: “All those blue lights are bothering me, Mom”… Be Sensitive… Autistic People process differently and may be bothered by sensory input and/or judgments that they are a tragedy that needs to be fixed… so please be sensitive and try to see their perspective. This entry was posted in acceptance, Aspergers, Autism, autism stigma, empathy, Humour, perspective of others, reframe tragedy, Shame and tagged acceptance, April is Autism Awareness Month, Autism, blue lights, honouring, Perspectives, stigma. Bookmark the permalink. Gretchen, what you “lack” is just an abstraction. What you are and have, is what is true and valuable. Keep your heart open, and your dreams alive, and one day you will find someone who finds in your heart-warmth and in your loyalty (and in all the other qualities which make you you), just what they need. Yes. That is beautifully said… Just yes.